This is the summer jacket that Hong Kong outfit Prologue have been making for me over the past six months. It is finally ready, with two fittings, and I think the result is great. It’s not perfect, but the fit is good and the work solid too. If this were a £3000 bespoke jacket from a top-end tailor, I’d be more hesitant in recommending it. 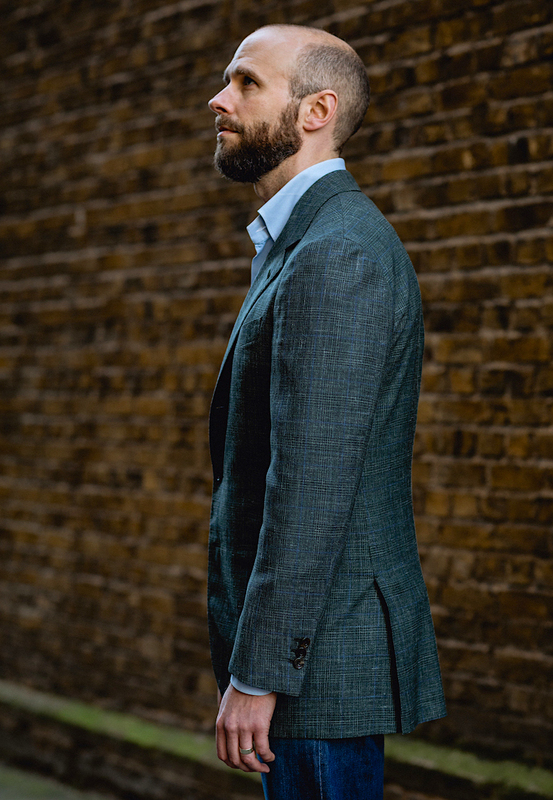 But given Prologue’s price point (suits start at £950) and stated approach of catering to those on a lower budget, or just starting on their bespoke journey, I have no such hesitation. I’ve written previously here on who Prologue are, how they started and what their product is. If you haven’t read that post, please do so for a full rundown. 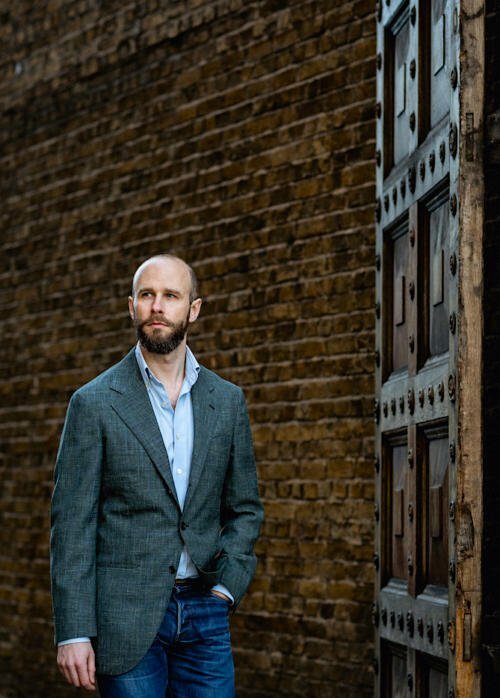 In brief, Prologue was founded by two guys, Jerry and Chris, who wanted to work with a tailor in Hong Kong to produce suits in the style they liked - but at a lower price than the visiting Europeans they’d bought from on trunk shows. This is not an uncommon story, and many people have done things in this area over the past decade. There are just so many tailors in Hong Kong - all saying they can make anything - that it is inevitable a fan of tailoring will end up trying to shape a tailor’s product into something similar to Naples or Savile Row. Jerry and Chris, however, have done this well for a while now, found a style and a production system that works for them, and are putting out a consistent product. They call that product ‘semi-bespoke’ because they work from existing blocks rather than drafting from scratch. Although frankly, if you’re not a trained tailor and are communicating fit to a remote workshop (theirs is now in mainland China) then working from a block is probably safer. And, they don’t use all of the hand-work you’d normally get on a bespoke suit - although that has evolved and improved. So for example, their lapels and collars were always hand padded, but not the chests on some jackets. Now the chests are hand-padded too. Mine is one of the jacket styles that wasn't hand-padded before, but if I ordered it now, it would be. 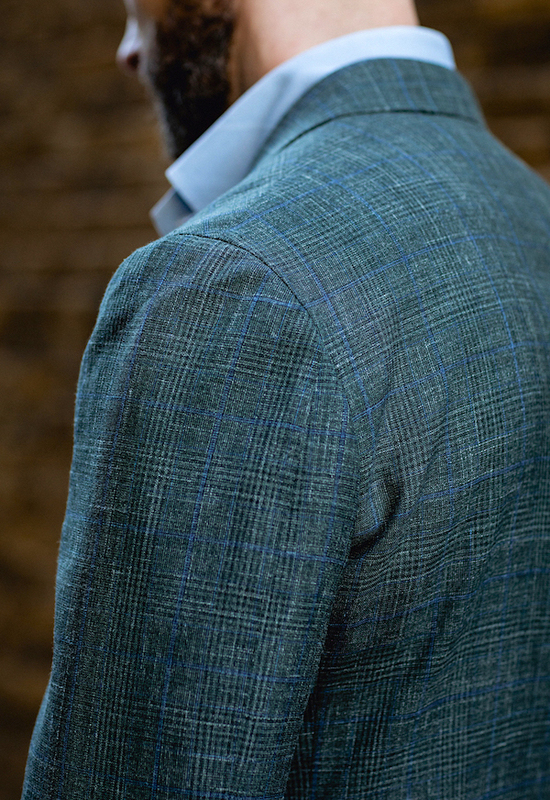 My jacket was made in my favourite cloth for a summer jacket: a wool/silk/linen mix. Here, 380123 from Caccioppoli (250g). It is a three-roll-two front, with flapped hip pockets (tucked in here) and a welt chest pocket. 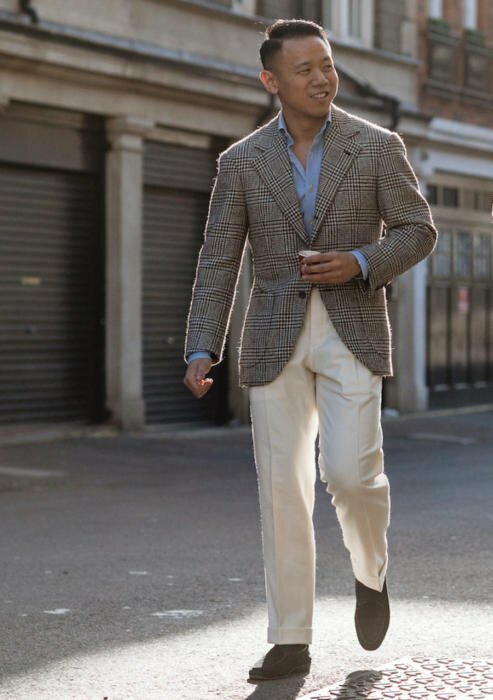 The Prologue style, like many these days, is most similar to southern Italian, with its lightweight canvas and soft shoulder (here just canvas in the shoulder), straight lapels and open fronts. But not cut as close as most Neapolitans, or with such a small shoulder. The result is a flattering cut that, for me, is still casual enough to wear with the most casual trousers, like jeans and chinos. However, I should say that I’m not sure the cloth necessarily works with jeans, despite being pictured here that way. It would be better in a rougher, more slubbier linen like my vintage one. At my first fitting, the biggest issue was the jacket collapsing slightly on the right-hand side. That shoulder is lower than my left, and it’s a problem tailors often have. Deciding how to correct this is something an inexperienced fitter could struggle with. Do you lift up that whole side? Clear the armhole? Just tighten the shoulder? Jerry and Chris opted for the latter, and I was a little unsure how it would turn out. Fortunately the result was good. Not perfect at the second fitting, but perfect in the final jacket. Another issue was the pitch and position of the sleeves. The right in particular was twisting rather and causing creases to run down it as a result. This was largely corrected over the fittings. I wouldn’t say it’s 100% now, but no one would notice if they hadn’t seen the initial issue. Finally, I think even in the final jacket the collar could be a touch tighter on the neck, and the back lifted a little on either side. To compare this experience to other bespoke tailors, I’d say it would surprise me to have things like this come up with a large house like Henry Poole, Caraceni or Liverano. They’re just too experienced and professional. But it has come up with smaller tailors, in particular Neapolitans like Solito or Formosa, and so Prologue being at that level is already good. 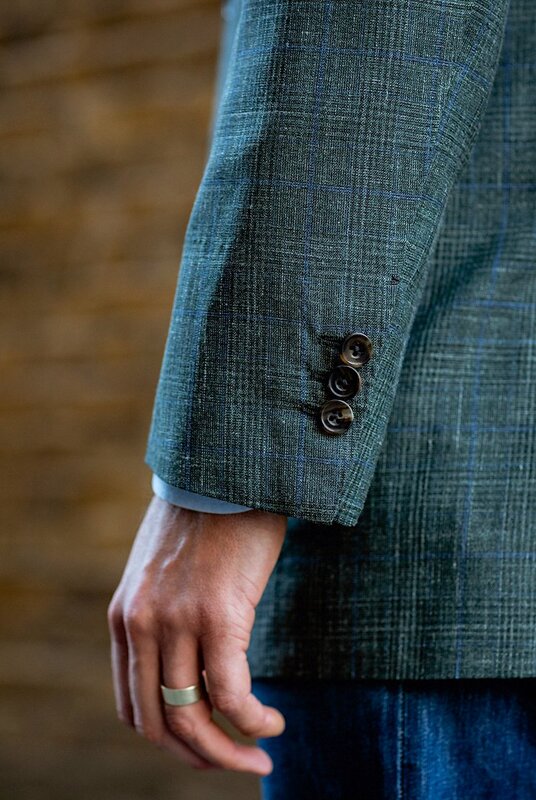 The finishing inside the jacket is good, neatly done, and equally on the buttonholes and edge stitching on the outside. The only thing I don’t like so much is the Milanese buttonhole. The stitching around it isn’t that fine, and on a purely personal level, I don’t like how large and open it is. I’m also not a big fan of the red tack stitch that Prologue put on their breast pockets. It feels a little gimmicky and - as with Dalcuore, who put one on the lapel - I opted to have it removed. The red stitch is an interesting one, because actually I think another big advantage the Prologue guys have is taste. Few big tailors are plugged into what young bespoke consumers want in terms of cloth or cut. Less forgivably, few are interested enough in clothes to have much view on how their tailoring is worn. That isn’t a new thing. Historically it was always the front-of-house guys on Savile Row - not the tailors - that were the stylish ones. Craft and style rarely went together. 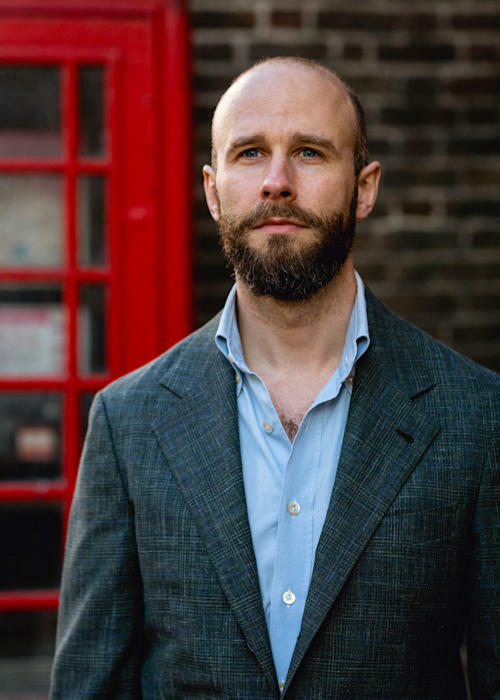 Having someone like this to work with a tailor is still undervalued today - and you can see how well it works with The Armoury guys and their trunk shows, or someone like Gianluca Migliarotti working with Lino Pommella. Jerry and Chris wear their clothes well. You can see this in what they buy and feature: there’s a Marling & Evans cloth in undyed wool (above, on Jerry) that I really want, based off seeing them wear it. They’re not influencer/model types, but they have understated style. I’d say that’s also evident in the Mandarin jackets they’re developing - the brown version of which (below) was on display at the pop-up. 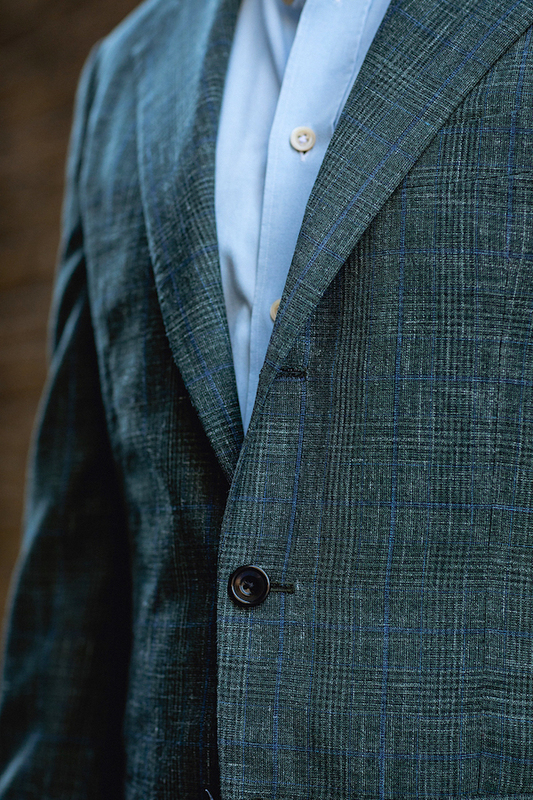 Little things on that jacket, like the height and angle of the collar, make a big difference in turning it from something that looks like a very traditional Chinese jacket into something much more modern. Given my experience, I think Prologue are offering a great option at their price point. It’s not a fit to rival the best tailors in the world, but that shouldn’t be surprising given the way they’re working from blocks, with a remote workshop. And the make isn’t full bespoke either, but it’s pretty close. Indeed, given these differences from bespoke, it’s perhaps more similar to the very best of made to measure, such as Saman Amel’s Napoli line. The price is just much more competitive, for being made in China. Suits start at £950 and jackets at £780. Mine was rather more expensive at £1150, because Caccioppoli is so expensive in Asia, around £135 a metre. But that glen-check Marling & Evans jacket pictured on Jerry would be £940. Prologue have a nice little store in Hong Kong that’s worth a visit if you’re there (3 Shin Hing St, Central) and are starting to travel regularly. Currently they’re going to London, Stockholm, Hamburg, Shanghai and Beijing every 3-4 months. They'll be in Shanghai May 17-19 and Europe in June, dates TBC. 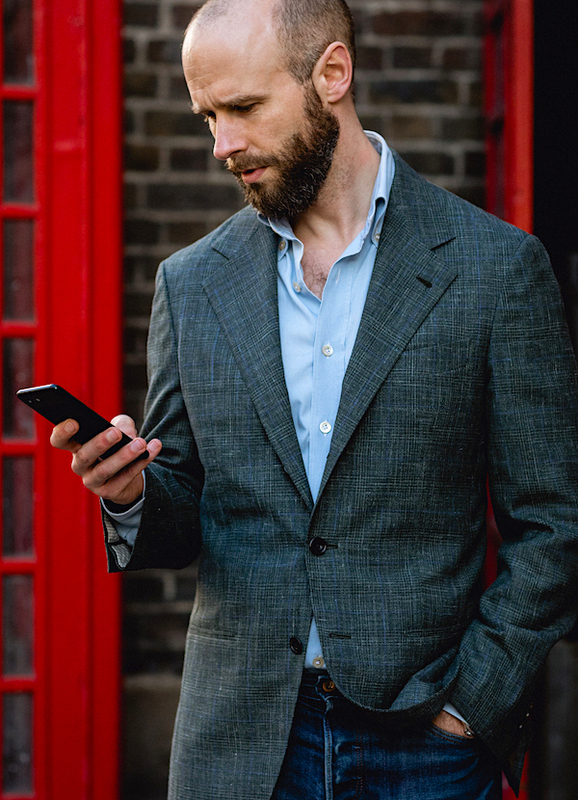 You can follow the discussion on Prologue semi-bespoke summer jacket: Review by entering your email address in the box below. You will then receive an email every time a new comment is added. These will also contain a link to a page where you can stop the alerts, and remove all of your related data from the site. Lovely jacket. However, as you point out yourself, I’m not sure it goes with jeans. What are your thoughts on the weight? I’d have thought 250g a little too flimsy. 250g is very light, but nice for truly hot weather. Perhaps only worth getting when your wardrobe is at the stage that you can get quite specifically seasonal pieces. Wouldn’t you say it’s mostly about color (dark, corporate) and finish (smooth)? Any comments with the issues on the canvassing on the right front (collapsing) and at the back on the waistline/skirt, apart form the sleeves of course. These points where discussed during fittings? As ever, I’d warn against concluding much about aspects of fit from photos. But happy to answer what the personal experience of the fit is in any parts of the jacket. – The chest is fine: any suggestion of collapsing after the alterations during fittings is due to stance and a very lightweight fabric. – Equally the wrinkles on the back at the waistline: any lightweight fabric will wrinkle there as it sits against the trousers, particularly if unlined and particularly with something like jeans. This looks great Simon and certainly worth the wait. I would say the cut is very flattering on you, more so than some of your southern-Italian-styled jackets. It’s certainly light, yes, but I’ve had the same kind of wool/silk/linen before – see my Solito here, for example. It wears well enough. The ‘self’ lining of the forepart is fairly standard, and appealing if you really like the material. I’ve had it in a few things from Naples over the years, though found it works a lot better in materials like this than in hairier things like tweed. How would you say this compares to something like Anthology? Hard to say, as I haven’t had a final piece from Anthology yet. Have you try wwchan too? if not, what is the mean reason? Lovely cut. How is the range of movement compared to for instance Saman Amel Napoli or The Anthology? Higher armhole or pretty similar? Another question: how come you went with canvas only in the shoulders? I would have assumed no canvas in the chest goes best with no canvas.. well, anywhere. Similar, though again can’t really compare to the anthology yet. I think you might have misunderstood on the chest. There is canvas there, as there would be in any tailored jacket other than a shirt/jacket. And you’d pretty much always want canvas at least in the shoulders. It’s hard for the line to be clean otherwise. There isn’t any padding. In the Saman Amal review and comments, your conclusion was that the suits they offered had superior finishing to some of the smaller Neapolitan houses and that the fit was basically perfect (though you did caveat that MTM doesn’t reach the same level of fit as bespoke). The conclusion I took from that was Saman Amal offered as good a fit as you would likely want (unless you’re shelling out for Cifonelli-level bespoke and superior finishing to cheaper bespoke offerings at probably 70-80% of the price. Based on this review Prologue can do that at less than half the price of Saman? So at about 30-35% the price of a travelling Neapolitan bespoke tailor’s price point, they can offer something that is superior in terms of finishing and not noticeably worse when it comes to fit? Just confirming if I have the logic correct. Because that would be a massive vindication for Prologue and the potential of Chinese makers. Yes and no. Or to be more precise, it’s more complicated and it depends what you want. 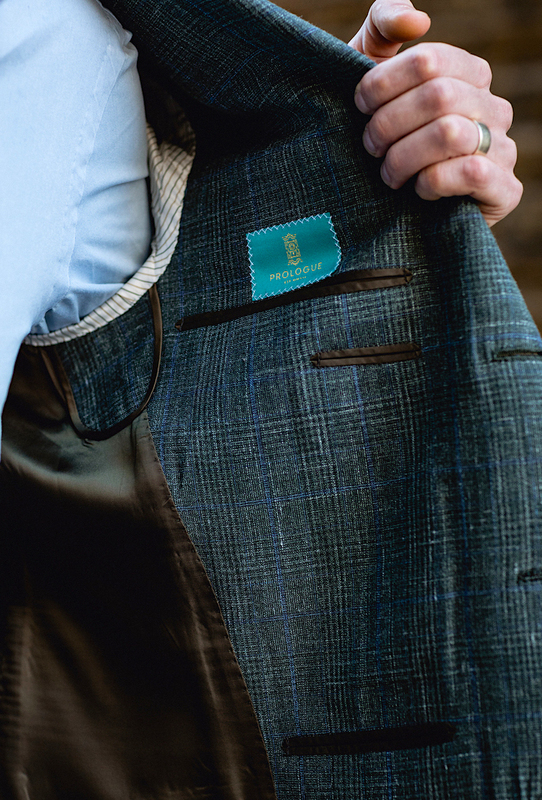 – Prologue fit well but still not at the same level as a really strong bespoke tailor. But, they do have some more of the bespoke elements like a smaller, higher armhole. The finishing also isn’t at the same level as most bespoke tailors outside Naples. Overall, it’s a better and cleaner comparison to compare Prologue to another bespoke tailor, rather than Saman Amel. And on that point, they do very well and it’s a great product – but you don’t get quite the same level of fit, experience or finishing as most bespoke tailors. The only difference with Neapolitans is the finishing is about the same. 2. They’re making in China. Which matters to some and doesn’t to others. But like Whitcomb & Shaftesbury, it makes a bigger difference than anything else to the price. In such a labour-intensive product, it allows you to cut 30-40% off. Even when you’re Huntsman and going from a £5.5k suit to a £3.5k suit, the discount is around the same. Thanks for the detailed response, Simon. Very much appreciated! 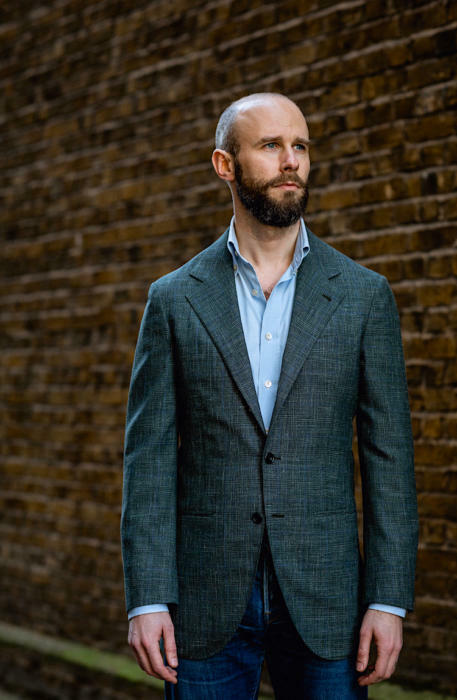 In terms of make, would you say that the level of Thom Sweeney is more comparable to the level of the large houses that you mention above, or are they more like the smaller houses (Solito, Formosa etc.)? – and style is completely subjective. Thom Sweeney is particularly different to the other two, and I wouldn’t say they have the same style at all. You’re still getting more of a British cut. A great review and one that I can wholeheartedly agree with having collected my Holland & Sherry summer jacket from Prologue during the recent PS pop-up. The overall fit is very pleasing (better than most other made to measure tailors I’ve tried) and the cut flattering. The red tack stitch is a little jarring – particularly on a lighter coloured jacket such as mine. The skirt also seems a tad reluctant to shield my bottom from prying eyes. As you noted the vents could be a little deeper. As my girlfriend noted my bum could be a little smaller. For both these minor issues Jerry has already said they’re more than happy to do whatever is required to rectify them. He is a pleasure to deal with and I wish him and his team all the best. Thanks for the informative post to confirm what Simon has said. It is always nice to hear from other people who have had the same experience as it illustrates that Simon isn’t just getting the special treatment because he has such a voice. 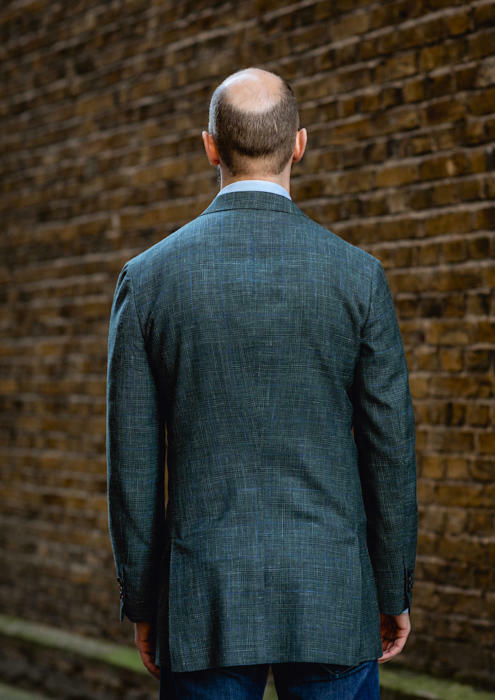 I really dig the gorge height, it looks lower than your similarly styled jackets… Have you measured it? Hi Simon, what is the difference between ‘semi-bespoke’ and MTM, if the former uses existing blocks and partial hand work? MTM varies a lot, but generally it has just one or two blocks and doesn’t vary that much from them in a 3D fashion. The extent of that adjustment through fittings is the bigger differentiator with products like this – it’s just that that is harder to define, is less binary. You had me at “produce suits in the style they liked – but at a lower price”! I spoke with Jerry at the PS pop store recently and was very impressed by him and the what he sells . Coincidentally, the same day I tried on a Anglo Italian jacket , which is of similar soft tailoring , but considerably higher price point. I understand that they model their jackets on Liverano (or at least they did when they first started) . Could you see any similarity ? Also how many fittings are required for a MTM ? Anglo-Italian is made in Italy, so you don’t have that Chinese-made discount. Like a lot of new tailors these days, there are elements of Liverano and Naples in there. But Prologue is a bit more Naples generally, just a slightly wider shoulder. By MTM I assume you mean the semi-bespoke at Prologue shown here? If so, usually one, sometimes two. Sorry Simon, the jacket seems generic and the fabric dull, uninspiring and dated. The tone is not a great look on you as it looks, forgive me, rather cheap (I think the fabric, not the cut to be at issue). I compare this to the Armoury jackets recently featured. It also sits, uncomfortably, outside of the more recent tranche of stylish wear that you have commissioned (W&S belted polo, Ettore de Ceasare suit, PS Bridge Coat, Hitchcock Donegal Tweed etc.). Other than this feature I’m just unsure why you commissioned and whether you will ever wear it. I’m surprised you think so. 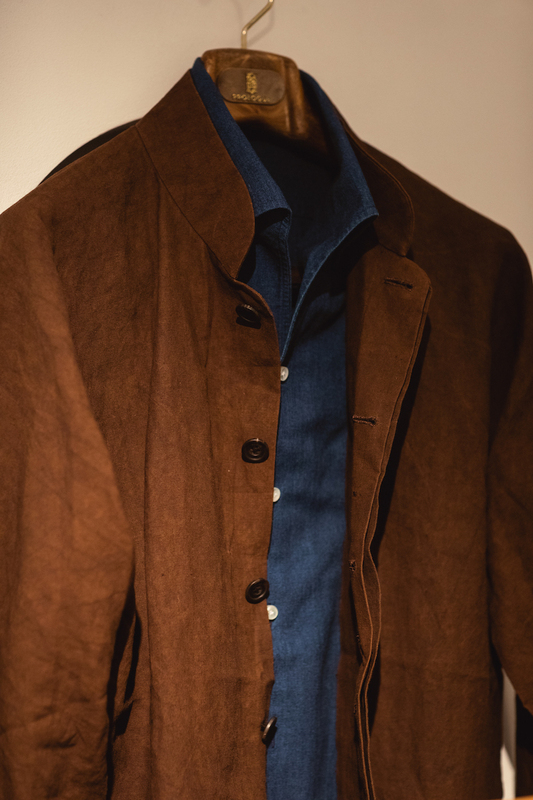 It is very similar to my Solito brown summer jacket, and I will wear it in exactly the same way. For a casual summer jacket, I think this weight, make and pattern in a brown and green are great starting points. What kind of fit issues will a jacket collapsing on one side creates, and what’s the most common method to correct it? It just doesn’t look clean and sharp, primarily. I’ve been admiring their instagram posts for quite awhile, and am happy to have this review. If they were to visit New York, I’d certainly give them a try.